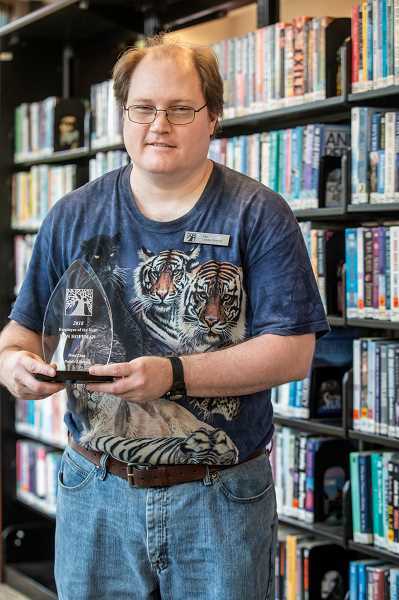 WL Library honors Dan Hoffman with first annual 'Employee of the Year' award. Melanie Nelson can remember just one instance when Dan Hoffman was unable to track down a missing book at the West Linn Public Library. Over the course of about 12 years working as a page at the library, Hoffman has become intimately familiar with each row of shelves and the books they contain — to the point that Nelson, who is the assistant for Library Director Doug Erickson, and other staff members know Hoffman's the one to turn to when they're at their wit's end. So what happened with the one book Hoffman couldn't find? "We found out it was stolen," Nelson said. "Every time, he finds it. He's like our little hound dog." 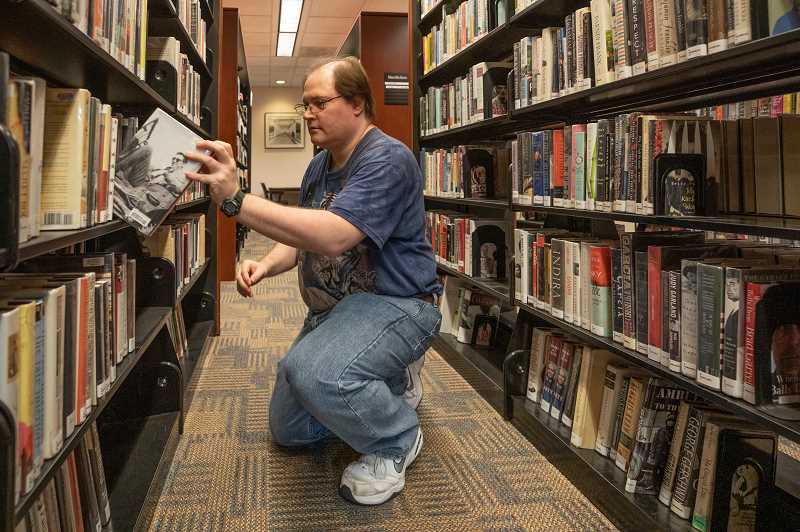 But finding missing books is just one small facet of Hoffman's tireless work, which recently earned him the library's first "Employee of the Year" award. Erickson created the award at the suggestion of Teen/Tween Librarian Rebecca Mayer and Children's Librarian Kimberley Rhoades, who had Hoffman in mind when they came up with the idea. "He's probably the only person who's touched every single book in this library," Erickson said. "He's a real asset to us. It would be difficult for him not to be employee of the year every year." The award was presented as a surprise to Hoffman at a post-holiday party held at the Willamette Ale and Cider House. According to Nelson, employees recited a series of thoughts about the winner of the award, referring to him only as "this person" until Erickson finally announced Hoffman's name. "I felt very honored," Hoffman said. "I wasn't expecting it at all. I was touched." Hoffman, a longtime West Linn resident who attended West Linn High School, started his career at the library as a volunteer. "I volunteered here for about a year and a half, and I liked what I was doing," Hoffman said. Specifically, Hoffman appreciated the relationships he built with staff members and patrons alike. That, more than anything, is what's kept him working there for more than a decade (he did leave for a brief period of time before being re-hired by Erickson after he arrived as director). "I really like my coworkers — they're really nice people and I get along great with them," Hoffman said. "I also like helping people. I like public service." Never is that more clear than when Hoffman is asked to find a missing item, whether it's the latest bestselling novel, an obscure DVD or a popular children's book. "The minute you ask Dan to go out in the stacks and find it, he always finds the item," Nelson said. "It could be completely in the wrong spot, but he will go from top to bottom in the library." "My first encounter with Dan was because of a magazine issue I couldn't find on the shelf," librarian Cheryl Hill said. "Someone told me, 'Have Dan look for it. I bet he'll be able to find it.' Sure enough, Dan found it, even though it had been mis-shelved." Quite simply, Hoffman is the Swiss Army Knife that keeps the library churning — and his colleagues wanted him to get some long overdue credit. "Dan probably does more to ensure patrons have a good experience than any of us," Library Manager Rick Peterson said. "On top of being ultra-reliable and getting our constant flow of carts shelved so quickly, Dan is out there catching labelling issues and other mis-shelved items that others might miss. The end result is that patrons always find what they need. "That's the foundation of what we do, and Dan is the foundation of our team." Perhaps you've met Hoffman and experienced his dedication firsthand as he helped you find a needle in the book stacks. But, more likely, you've benefited from Hoffman's handiwork without even realizing it. "Dan seems to know everything that needs to be done, and does it with such efficiency and quiet grace that it seems as if the library is organizing itself," said Mayer, the teen/tween librarian.